Located in the far southern region of the Smokies, near Fontana Village and the Little Tennessee River, Twentymile is an area of the national park that is a little less traveled. Primarily used by backpackers as a means of accessing remote park highlights like Gregory Bald or Shuckstack Fire Tower on the Appalachian Trail, Twentymile can also be enjoyed by day hikers or creek seekers year round. Like so much of the mountainous Smokies, Twentymile is blessed with water, water everywhere. Two-thirds of the length of this loop is alongside rushing streams that are the life blood of the forest. Twentymile is a nice place to just lose yourself in Nature. I walked the loop on Friday, October 16, 2015 from 9:15AM to about 1:45PM. My plan was to take the Twentymile Loop clockwise along the Wolf Ridge and Twentymile Trails. Hike Rating: Moderate. You will climb more than a thousand feet, but it is so mellow that you won’t even break a sweat. Trail Condition: Very good. The entry path, Wolf Ridge and Benton MacKaye trails are old logging roads, while the connecting stretch is the only single track. Be careful on footlog creek crossings. Starting Point: Twentymile entrance to Great Smoky Mountains National Park. Trail Traffic: I encountered 20 other hikers, nearly all on the Benton MacKaye Trail in the afternoon. More than half of them were making their way into the backcountry. How to Get There: From Asheville, NC take I-40 to exit 27, the Great Smoky Mountains Expressway. Continue south/west 49 miles. 12-15 miles past Bryson City, turn right on NC-28 north. Continue more than 20 miles through Stecoah, past Fontana Dam and past Fontana Village. Cross the Little Tennessee River bridge and follow the twisty river road until you come to a 10 mph hairpin turn. The Twentymile park entrance is on the right in that turn. Parking for about 15 vehicles is on the right about 200 yards up the road. October, of course, is prime leaf peeping season along Hwy 441 through the heart of Great Smoky Mountains National Park. Reports I have heard and seen online indicate that this year has been more popular than ever, with huge lines of traffic backed up for miles. What to do? What to do? The Smokies is so much more than just Newfound Gap and Chimney Tops and Elkmont and Cades Cove. There are hundreds of thousands of acres of backcountry out there just waiting for you to put on your hiking boots. One such area is Twentymile, named for the Twentymile Ridge that stretches from Shuckstack to the Little Tennessee River that marks the southern boundary of the national park. I didn’t know quite what to expect upon my arrival, and was somewhat surprised to see that 2/3 of the parking was already taken when I got there. What I remembered, though, is that lots of hikers are setting off from here on multi-day treks on the Appalachian Trail, or up Wolf Ridge to Gregory Bald and beyond. Me? I was just here to explore the 7-mile Twentymile Loop. Now that’s confusing. The trail starts out following Moore Springs Branch on an old logging roadbed for a half mile to a footbridge crossing. There it meets two trails that form a “V” at the base of this loop. On the left is Wolf Ridge Trail and on the right is Benton MacKaye Trail (known as Twentymile Trail here). At the top of the “V” the Twentymile Loop Trail connects the two to form the loop. I chose to start on the Wolf Ridge Trail, thereby taking the loop in the clockwise direction. Wolf Ridge Trail is also an old roadbed that follows Moore Springs Branch for 1.1 miles to the next junction. The Kitchen Lumber Company logged this whole area in the 1920s and built railroads up Twentymile Creek and Moore Springs Branch. The trail was covered with fallen leaves meaning it was hard to walk quietly. The swish-swishing of my footsteps would certainly alert any wildlife that may have come to the creek for a drink. 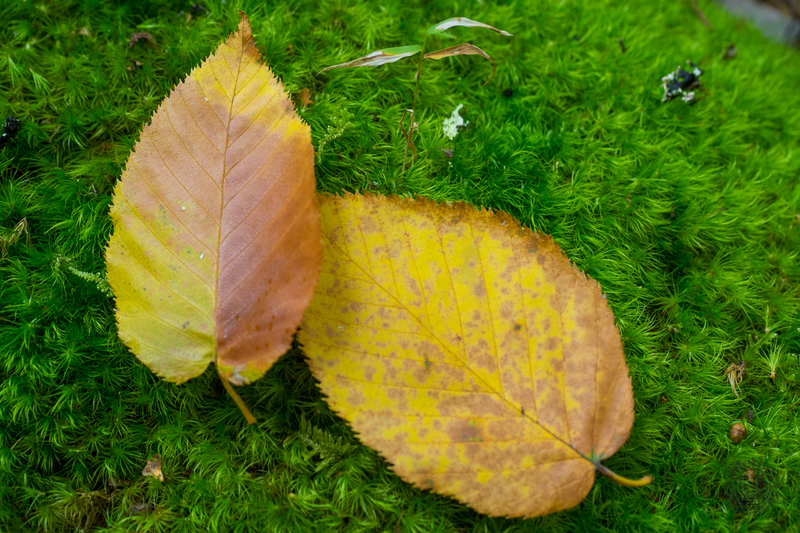 Despite so many fallen leaves, the forest was still mostly green, somewhat of a disappointment in my quest for fall color. It is, after all, less than 2,000 feet elevation here. Look for this area to be colorful around November 1. It is a very gradual ascent up Wolf Ridge Trail, most of it right beside Moore Springs Branch. There are plenty of places to stop and listen. I love the sound of rushing water in the forest. To me it signals freshness. Along the pathway, there are seven distinct footlog crossings of the creek, each their own opportunity to sit down, hang your legs over the side, and revel in the sights, sounds, and smells that accompany the clean mountain water. The photo up top is one. Since I was hiking alone, I had lots of time to observe little things along the ground that caught my eye. I spent a good portion of the day sitting at woolly worm level pointing the camera at moss and nuts and flowers and fallen leaves. It was fun. At the junction between Wolf Ridge Trail and Twentymile Loop Trail hang a right. Wolf Ridge Trail continues for several more miles past backcountry campsites and eventually on to Gregory Bald. Unlike all the other trails on this loop, you are now on a single-track tread through mixed forest. This connector to the Benton MacKaye Trail is 2.9 miles long, and climbs nearly a thousand feet in the first half of that distance. Again, it isn’t strenuous. I hardly broke a sweat. You quickly leave Moore Springs Branch behind and the forest becomes much more quiet. Even the swishing of fallen leaves was gone now. The silence enabled me to hear it. As I rounded a turn, off to my right, I heard the clop-clop of hooves striking the ground. I looked quickly to see the fluffy white tail of a deer bounding away, melting into the woods. Another advantage of hiking alone. It seems I rarely see wildlife when I’m with companions. The conversations warn them that we are approaching. There aren’t any long distance views, or waterfalls, or rocky outcroppings along the Twentymile Loop connector. But I wasn’t disappointed in the least. I found so many little things all along the pathway, just by paying attention to my surroundings. In addition to the climb, I got some great exercise simply by sitting, then standing, sitting, then standing as I stopped to take pictures of the ground-level scenery. I’ve intersperse them throughout the gallery below. When I reached the crest of Long Hungry Ridge it was time for a snack. There was a perfect log to sit on, and listen. At first it seemed totally silent. But as I listen more intently, I hear a chipmunk chirping, and a bird calling, and a fly buzzing. A wisp of breeze blows the maple leaves. A few yards away a hickory nut falls. I guess maybe it isn’t so silent after all. It’s now downhill for a mile, again very gradual. As you reach the joining of several small streams there is another footlog crossing as this trail makes one final short climb to Proctor Field Gap. I’m told that this area of adjoining streams is flood prone during snow melt and after heavy rain, so be aware. Aside from the trail sign, another way you’ll know you’re there is from the looping grapevine that hangs from a tree at the junction. To complete this loop, turn right on the Benton MacKaye Trail, also known as the Twentymile Trail. However, if you turn left, you will reach the Appalachian Trail in a mile and a half, and eventually climb to the Shuckstack fire tower. Perhaps another adventure for another day. For the next three miles back to the beginning you will descend all the way. After the first half mile you are joined by Twentymile Creek, a little larger than Moore Springs Branch. I also began to see several backpackers coming up as I was going down, no doubt headed for a weekend in the Smokies wilderness. They were usually in groups of three or four. By now it was afternoon and I was getting kinda hungry. There was a rocky beach area at the base of a small waterfall that seemed ideal for lunch. While I was munching I played around with some water-level photos and watched the fallen birch leaves float in circles in the eddies of the stream. A few more hikers passed by, not even aware that I was 25 feet away. Makes me wonder how much wildlife we miss so close to us on every hike we take. The farther down Twentymile Creek you get, the more rugged the terrain. There are lots of little 4-5 foot falls and slides. Also, unlike the footlogs of Wolf Ridge Trail, there are several full-fledged footbridges across this creek. They make excellent platforms for shooting photos of the cascades. About two miles from the trailhead is backcountry campsite #93. Speaking of cascades, near the junction with Wolf Ridge and the entry trail, there is a series of small waterfalls that is actually named Twentymile Cascades. Unfortunately, at this time of day the lighting was very harsh with bright sunlight, so photos were quite difficult. Still, it is an impressive display, one very worth the visit. On the inward third of the loop you’re following Twentymile Creek. Several footbridges cross the creek and offer vantage points for pictures. Look for the rhododendron to bloom in June. Soon after Twentymile Cascades, I reached the junction, crossed Moore Springs Branch, and made the final half mile return to my car. All in all a totally delightful day that took me four and a half hours. Obviously, you can make it a lot quicker if you don’t pause so much for photos like I did, but you might as well stop and smell the flowers as they say. While you’re in the area, you might also want to take in some of the other sights like Cheoah Dam or the Tail of the Dragon off to the west. Eastward you will find Fontana Village and the marina at Fontana Dam. Look for the best leaf peeping in the area around the first of November. To summarize, this is a very nice hike that isn’t too difficult but will enable you to spend several hours in the forest. Definitely an all-season hike, I’ve heard the trails are lined with wildflowers in spring. Because of its lower elevation, even the winter won’t be too bitter. 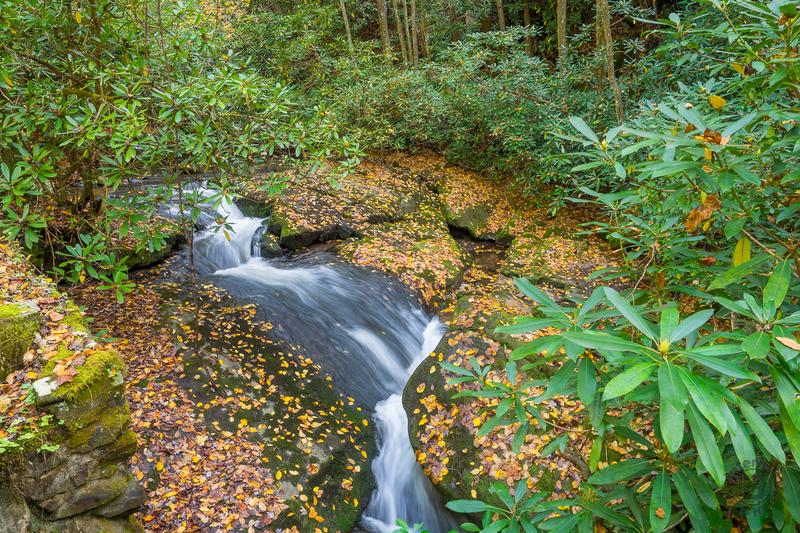 There are plenty of water features along the way, and beautiful mixed hardwood forest that includes oak, maple, hickory, buckeye, and so many others that fill the Smokies. The trails are certainly child friendly, but with more than seven miles total distance, it might be a bit much for those under 6-7 years of age. If I had one thing to do differently, I might choose to take the loop counter-clockwise in order to see Twentymile Cascades in the morning when you aren’t faced with the harsh lighting of afternoon. Otherwise, I don’t think it’s any easier or more difficult based on the direction. Remember too, there are plenty of options for longer hikes as well.